How does the idea of going to a completely abandoned theme park where the Balinese wouldn’t dare to ever visit because of the crumbling buildings, pitfalls, wandering spirits, and man-eating crocodiles that are rumored to hide in the park? Sounds pretty creepy. Let’s go there! Just north of the city of Sanur, is an abandoned theme park called Taman Festival, a multi-million dollar project that came to a sudden halt during construction due to a number of economic issues that arose. Now, the park is taken over by the unforgiving Mother Nature and totally vacated. Totally perfect for exploration and spirit hunting. Also maybe crocodile hunting? By the way, if you’re keen, you can still find this place on GoogleMaps. We asked our reliable taxi guy Archyar if he could take us to the Taman Festival. Not exactly sure where it was since locals don’t ever go there, Sam guided Archyar to the destination which was not too far away. Once we approached, we saw an unpleasant ticket booth out near the street. Archyar said he would wait on us for about an hour. It would get dark soon, so an hour was fitting, though I felt more time would be needed to explore the majority of the park. Once Sam and I approached the grounds, a stubby local man came out of nowhere and ran up to us. “20,000 rupiahs to enter,” he said in his broken English as he held out his greedy hand. Sam and I looked at each other, both knowing that we didn’t have to pay a fee to enter Taman, but we also knew that 20,000 rupiahs converted to less than $2 USD. So instead of causing a fuss about this guy trying to extort us, we simply handed him 20,000 rupiahs. There is no point in arguing over two measly dollars. The stubby man disappeared and we entered Taman, the abandoned theme park. My world instantly shifted from an engaging busy, bustling Bali city full of people into a desolate alternate dimension, dark and void of any life and filled with an unquestionable eeriness. The beginnings of the park seemed to sprawl into multiple paths. Which path shall we take? Where the crocs at? We took a left towards a myriad of decaying buildings. It looks to have been the accommodation area. Maybe? The floor was damp and covered in algae and mold. Broken shards of glass and building debris crunched upon each step we took. Bats hung high above us in what was left of the ceiling. I didn’t feel comfortable there. …and bizarre caricatures that seemed to stare right at you, straight through your soul. Even if I were homeless, I would not want to live here. We slowly scoped the area, creeped out yet fascinated at the same time. There used to be a story to this place. It was meant for something fun and magical but instead ended up being one of the most disturbing places in Bali. We entered a spacious corridor, where things began to get real dark. As I footed along in the silent black like a dummy, Sam decided to jump scare me from behind which startled me and caused me to stop and thank goodness for that because we almost stepped right into this random hole in the ground. That would have been real bad! From then on, we used the guidance of our phone lights to prevent anymore missteps. The lights from our phone revealed more strange things to us. Who or what sat in this chair? Did I really want to know? But there was no way to find out. We were completely alone. No guide books, no map, no knowledgable guide, no nothing. We searched for clues that could be left around; the walls, the ground, in the holes, but everything was decayed, weathered, or overtaken by nature’s wrath. The sounds of bats flying above our heads was our only source of information that told us to get the hell out of this building! The bats were flying around really close to us and more than likely carried rabies. The interior of the building expanded deep into a black void that we weren’t prepared for. Rather, we didn’t have enough time and still wanted to explore more of the park. We exited the building the way we came and took a different path to another area of Taman. Who’s Earl and what happened to him? Although there were probably haunted spirits roaming around, and man-eating crocs somewhere, besides the rabid bats, our biggest enemy here were the mosquitos. They were relentless! They bothered us through most of the exploring, especially upon our discovery of what appeared to be ruins covered in jungle bush. We brushed through the thick, wet green into an open field, almost more of a swamp. Whatever that building was over on the other side, had “explore me” written all over it. Not literally, but you catch my drift. Look at how sinister and ominous it looks. Something was in there…I wanted to find out but at the same time…not find out. It looked like a gateway to somewhere murderous. The land leading to the ruins were thick in elevated water. Insects swarmed near our feet. There was no comfortable way to reach it. We even tried going on the outer bounds, which were as wet as the center of the field. No luck. And so, we backtracked and continued on deeper into the park. We then came across an old movie theater, called Turbo Theater. We def have to see what’s in there! We went around to the back and up the stairs into the room behind the theater seating area where the film strips are rolling. I’m not sure of the proper term for this. We found film strips scattered across the ground. What movie was this? Perhaps a horror film? When they abandoned this park, the really did abandon everything. This is the inside of the theater. Bats ruled this place. We ventured on further to what I think may have been the crocodile pit. Except now it was coated in green algae. No crocs lived here. This pool has been ‘dead’ for years. Our hour was almost up. It was best time to track back to the beginning and meet up with Archyar before he left without us. There was still much to explore and Sam insisted that I come back on my own while he was teaching during the week. That ruin in the jungle though…that is one place I would like to attempt to get to again during a dryer day. As far as the spirits that the locals were afraid of, well I’m not into that mumbo jumbo, but during the night would be a completely different story for me. The night makes everything freakin’ scary. (I am a grown man by the way). and that my dear readers is a place called India. Month number five into my Quest to the Seven Continents. Still such a long way to go. This has been my route so far since I left Michigan on the 1st of August, 2016. It’s now time to enter Asia, the mythical continent, beginning with a week-long stopover in Bali, Indonesia to visit my friend Sam. The direct flight from Perth to Bali was easy. Upon arrival, I could feel the warm humidity beginning to stick to my skin. It was familiar and it’s what I expected when being in Southeast Asia. I gathered my checked luggage, rolled through customs, and found Sam waiting for me at the arrival gates. We took a cab ride to where he resided in Bali, near Sanur. The island of Bali, Indonesia. Sam resides where the orange drop pin is located. He lived in a seemingly peaceful retreat; a hidden community in one of the gangs (alleys) away from the main streets. His abode was at the end of a winding walkway through a garden occupied by buggy critters and toads and a small pool that appeared to be the most refreshing of blues. After settling in (and readjusting to the humidity), we took a trip south to get my first taste of Bali in an area of interest called the Garuda Wisnu Kencana Cultural Park, home of the giant mythical humanoid bird monument, Garuda. According to Buddhist mythology, Garuda is a powerful deity under the rule of Lord Vishnu. It is a powerful warrior that overpowers its opponents and is known to eat only serpents. In Bali in particular, it has become a symbol of culture and popular amongst craftsmen and artists. This is the largest Garuda statue in the world standing at 18 meters tall and made of copper and brass. The Cultural Park is home to many other statues and monuments as well. They were cool too, but none as redeeming as my pal Garuda. Sam teaches during the week and so I had plenty of free time to explore Bali on my own. I spent most of the days lounging, being a lazy bum, but would venture out to specific sites Sam suggested I should see when I felt like it. 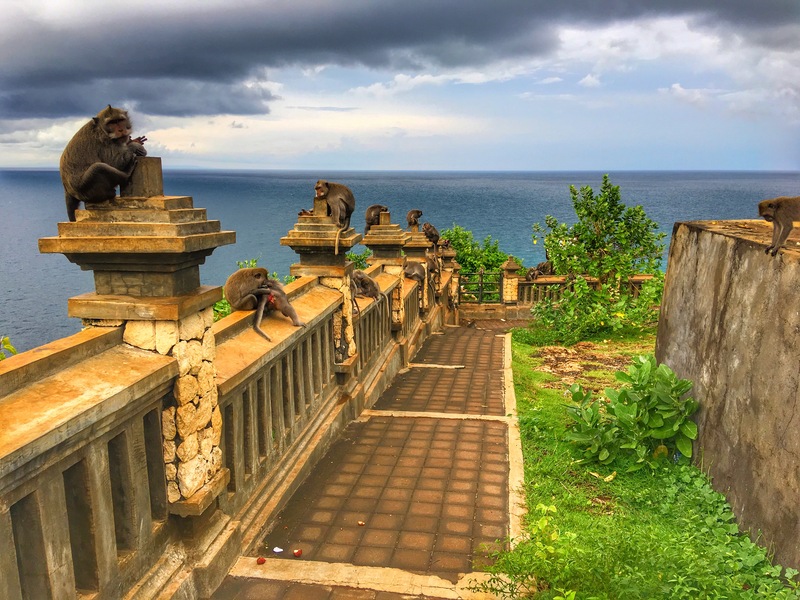 One of those places he suggested was the Uluwatu Temple, a Balinese Sea Temple in South Kuta. What was there? I shall soon find out. I summoned Archyar, a trustworthy taxi driver Sam and I befriended earlier, to take me to Uluwatu. Traffic was thick and hectic, but after about an hour we made it. The outside of the temple was filled with people; tourists and locals alike. Also, monkeys sneaking around on the high wires and rooftops of the dingy cafe roofs. They appeared to be stealthily scoping out the people walking below them, including myself. I googled it and found out these monkeys were called long-tailed macaques. Google also told me that they are kind of an agricultural pest but protected in holy temples, such as this one in Uluwatu. Uluwatu Temple is situated along a cliff ridge facing the South Pacific Sea. A linear trail takes you through smaller, adjacent temples and shrines and also through a few forests. Heavily dispersed on the path, a bunch of typical selfie spamming tourists, posing for their next Facebook profile picture. Further northward, the presence of macaques grew and their antics were attracting the curiosity of the tourists. I held my gear close. I didn’t have anything loose on me for them to try and nab. Only my phone in my pocket and my heavy Canon DSLR. I wasn’t wearing flip-flops nor glasses; two common items for them to try and steal. I was useless to the macaques, but many other tourists were ready for prime picking. I witnessed an unsuspecting girl get her lunch sack nabbed right out of her hand. It was a banana and a sandwich in a plastic bag. That macaque opened the bag like a little human and went to town! Another woman got her fuzzy blue pouch stolen. The culprit took a few bites out of the fuzz, repeatedly spitting it out in disgust before it realized it wasn’t food, but kept the pouch anyway! I continued walking along, quite amused by the furry little thieves, popping out of nowhere, getting their tiny little human-like hands on things that didn’t belong to them. If anyone gets anything nabbed, it’s their own fault. As I progressed, the macaques began to quickly outnumber the dwindling number of tourists who mostly mingled near the epicenter of the temple. I walked along the ridge until I noticed a dead-end just about. It was just me and a blockade dominated by macaques. There must have been a hundred of them along the rail and surrounding, easily! I paused for a moment and looked back. There were just a few people a few yards behind me, but they didn’t dare come close to the side taken over by prankish macaques. I had nothing on me they could nab. My DSLR is too bulky for them, so into the bevy I went. I love monkeys and my desire to be as close to them as possible was strong. Then I noticed their fangs. Their fangs were ginormous and intimidating as heck! As I attentively walked into the horde, I looked upon the ones sitting on the ledges to my left. There were macaques of all shapes and sizes, some with fragile ugly baby macaques latched onto their mothers backside, front side, and whatever side. I would get looks but none that presented ill ease from them. Macaques scurried all around me as I walked on, but still none physically tried to bother me. One group of macaques had a sandal in their grasp. There’s some unfortunate tourist walking around in the temple with one sandal on. I would get some looks from time to time, but it was mostly like I was invisible to the monkeys. But then, it began to rain. Almost instinctively I tucked my camera under my shirt and whipped out my somewhat water-resistant iPhone to continue taking photos. I was now vulnerable to thievery. The macaques stared as I fumbled around with my belongings. I took a few more shots and searched for nearby shelter to wait out the rain. The macaques followed suit. I found a small shrine with a roof about 30 yards from the dead-end. There were about seven people squeezed sitting underneath protected from the sudden downpour. I squeezed myself in to make eight. The macaques came soon after and began to creep all around the shrine we occupied. They would leap into our shrine and bare their fangs, scaring the sh*t out of some of the tourist! Look up and there were macaques peering upside down from the roof, which was only a few feet above our heads. I hugged my backpack on my lap and carefully opened it up to secure my canon as a macaque sat next to me. Strangely, they weren’t bothering me but were absolutely terrifying the life out of some of these other tourists. Now that my camera was safe and secure, I didn’t mind getting wet, so I left the shrine and began to walk back. Many of the tourists who were around had already fled to shelter. I was alone, with monkeys, while downpouring, in a jungle temple. How sweet! I was planning on staying for the sunset but the storm clouds completely covered the sky. The rain flushed out more macaques onto the path that I needed to get back to the entrance. How do I safely get past these guys? I simply walked through, careful not to step on any tails. I bet these monkeys had venomous bites like the baboons in Tanzania did. I saw a monkey with a phone in its possession. It wasn’t trying to eat it, it just held onto it as if it were a prize. I continued to stroll on as the horde grew thin. The rain halted my temple visit, but I was okay with that. I’ve been “templed out” for a couple of years now and preferably spent more time interested in the macaques than the actual temple and shrines. Thank you, long-tailed macaque monkeys, for not messing with me, yet terrorizing everyone else. It was absolutely comical and it made my day! I phoned Archyar to retrieve me and no later than ten minutes, he showed up. I returned to Sam’s place in Sanur and told him about my time in Uluwatu. He then told me of a theme park he heard about somewhere in Bali, that Disney used to own but it is now totally abandoned and supposedly haunted. One of the most haunted places in Southeast Asia.